Just in time for New Year’s Eve celebrations, I had to post this recipe for white chocolate mousse. The white-as-fresh-snow mousse, topped with cinnamon and vivid red, in-season pomegranate seeds, looks really pretty and so festive this time of the year. It’s really perfect for the holiday season. Even better: this is a dessert that’s ready in about 15 minutes, with no cooking or baking required. Made with whipped coconut milk, this treat is plant-based, very low in cholesterol and can be dairy-free and vegan (if you use a vegan white chocolate). It’s sweet, rich, and really indulgent-tasting so it’s perfect served in mini dessert glasses, great for holiday parties. Important Note: Place can of coconut milk in the fridge 36-48 hours before preparing this recipe. The thick, solid white layer (that rises to the top of the can when refrigerated) is required for this recipe. Remove coconut milk from fridge and scoop the thick, solid white top layer into a mixing bowl (the clear coconut water at the bottom of the can may be reserved for a beverage or smoothie recipe). Add orange juice and vanilla extract, and use a hand mixer set to the lowest speed to beat the mixture about 2 minutes, or until a thick, heavy cream is formed. Break the chocolate bars into small pieces and place in a heat-safe bowl. Microwave for 40 seconds and stir. Microwave for 12 seconds longer and stir again, until all chocolate is melted (if chocolate does not fully melt after stirring, microwave for 10 seconds longer and stir again). Add two heaping spoonfuls of the whipped coconut cream to the melted chocolate and gently stir until combined. Slowly and gently fold the chocolate into the coconut cream until well combined. Spoon the white chocolate mousse into mini 2-ounce dessert glasses. Dust a generous layer of cinnamon over each, and top with pomegranate seeds. Serve. …Here are all of the ingredients you’ll need to get started. But First Things First: about 1 1/2 to 2 days before you plan to prepare this recipe, place the can of unsweetened coconut milk in the fridge. A thick, solid white layer of coconut will rise to the top of the can when it is refrigerated – this is necessary for whipping up the coconut cream used in this recipe. When you’re ready to begin, remove the coconut milk from the fridge and scoop that thick, solid white top layer into a mixing bowl. You can save the clear coconut water at the bottom of the can for a smoothie recipe (this Tropical Bliss Smoothie is a favorite of mine). Next, grab an orange, slice it in half, and squeeze the juice from one half. It helps to twist a fork through the fruit to get all of the juice out. Add the freshly squeezed juice to the mixing bowl, along with some vanilla extract. Then use a hand mixer set to the lowest speed to beat the mixture until you’ve formed a thick, heavy cream. Next, grab a couple of organic white chocolate bars (this recipe uses five ounces of chocolate, which adds up to about one and a half 3.5-ounce bars), break it up into small pieces, and toss it into a heat-safe bowl. To make this recipe vegan or dairy-free, vegan white chocolate bars are available. To save time, the chocolate can be melted in the microwave instead of over the stove top. But be careful with the microwave – – it’s very easy to over cook the chocolate, even by a few seconds, which can cause the chocolate to burn on the bottom and become lumpy. Microwave the chocolate for about 40 seconds and stir it up. Then toss it back into the microwave for about 12 seconds longer and thoroughly stir again, until all of the chocolate is melted. If the chocolate does not fully melt after stirring, try microwaving for 10 seconds longer and stir again, etc., etc. until the chocolate is melted. Next, add a couple of spoonfuls of the whipped coconut cream to the melted chocolate and gently stir until combined. Then slowly and gently fold the chocolate into the coconut cream until well combined. This mousse is really sweet and very rich, so it’s best served in 2- or 3-ounce dessert glasses like these lovely ones . First, dust a generous layer of cinnamon over each dessert. The cinnamon spice is such a perfect complement to the richly sweet white chocolate. 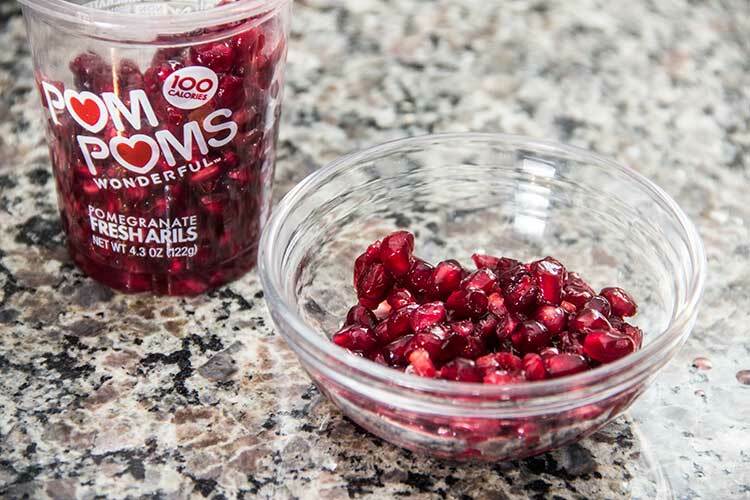 Then top with one of my favorites this time of the year: pomegranate seeds! They’re typically very easy to find pre-packaged in the produce aisle at the grocery from the fall through January. They are slightly sweet and a bit tart, with an addictive crunch that’s so perfect with the soft, creamy mousse. It’s a really rich, sweet, indulgent-tasting treat, and the cinnamon and pomegranate seeds add the perfect complements of spice, crunch, and freshness. This mousse looks pretty, elegant and festive for the holidays. Looks lovely and so easy! Happy new year! I am so craving white chocolate mousse after seeing this post. Love how easy and delicious this is to make too.. pinned!